from Germany and the countries of HAP-associated partners - Argentina, France, The Netherlands, Russia, USA - to work in one of the HAP-related experiments. The Helmholtz Alliance for Astroparticle Physics (HAP) offered scholarships for young researchers (master and PhD students according to the German university system or equivalent degree) to gain international experience in the field of astroparticle physics. Young scientists from abroad could apply for a research visit at a German institution and scientists affiliated in Germany for a research visit at an institution in Argentina, France, The Netherlands, Russia, or USA where at least the host institution, see also, for the visit is either a HAP member institution, a HAP associated partner or an official collaborator of one of the HAP-related experiments. At the bottom of this page can be found the list of previous iPROGRESS participants. Applicants should have completed at least 3 years or were master students of a university, or were PhD students or had an equivalent degree. The period of visit was up to 2 months for a master student and up to 1 month for a PhD student. The scholarship amounted to 650.- € per month for a master and to 1,000.- € per month for a PhD student, plus a lump sum for travel expenditure of 400.- €, or was at least in accordance with the DFG (Deutsche Forschungsgemeinschaft) rules. Applications consisted of a CV together with a project description for the visit coordinated between the candidate, his/her supervisor, and the contact person at the host institute. All documents should be written in English by the candidate. Prerequisite for an application was good spoken English by the applicant. Applications could be submitted at any time and the program was offered until end of June 2016. Click on the name for a description of his/her project. General goal of my work at KIT was test of the methods of primary particle reconstruction for Tunka Radio Extension (Tunka-Rex) experiment. I used about 300 Tunka-133 simulated events for two initial particles such as proton and iron with calculated radio emission. For energy estimation I used lateral distribution function (LDF). I tested two possible parametrizations: simple exponential ε(r) = εr0 exp[-η(r - r0)], and the gaussian ε(r) = εr0 exp[-a(r - r0)2 + b(r - r0)]. Also I tested the improvement could be given by asymmetry correction. During the internship, work was carried out with the driver ALPS, developed by IPE KIT. The driver allows to interact with the Xilinx FPGA devices 6 and 7 series via configurable xml notations. Conversion from raw data stream to processed data functionality has been implemented to ALPS driver. This allows to use complex processing to raw stream, and incapsulate processing code in the driver body. Also, the Python wrapper has been written for ALPS library. Wrapper allows to run ALPS driver functions directly from Python, which greatly simplifies the development of high-level applications such as web servers or graphical interfaces. HTTP, HTML and JSON servers has been written on the basis of the Python wrapper. Servers provide API, to interact with the device using TCP / IP protocol. Improvements made during the internship should greatly enhance the adaptability of the system, as well as simplify the hardware configuration process, allowing to debug each block separately. The Tritium Recoil-Ion Mass Spectrometer (TRIMS) experiment is designed to measure the branching ratio of molecular tritium beta decay to the bound 3HeT+ molecular ion and is currently being set up at the Center for Experimental Nuclear Physics and Astrophysics (CENPA) at the University of Washington (UW). It involves a combination of time of flight measurements and energy determination after electrostatic acceleration. This information can be used to determine the mass and the charge of the incident ion. The aim of the experiment is to clarify the discrepancy between theoretical prediction of the branching ratio and experiments performed in the 1950s. As KATRIN and Project8 intend to push the precision limit of direct neutrino mass measurements down to the sub-eV region molecular effects play a non-negligible role and it is essential to clarify this disagreement. After the testing of the prototype apparatus had been concluded successfully I joined the efforts of assembling and preparing the modified main apparatus. The main focus of my work was the characterization of the ion detectors. For that purpose we measured the capacitance and leakage current of the detectors and the detector mounts, assembled a test ion source and acquired an americium spectrum. Further tasks involved the installation, commissioning and field mapping of the magnets providing the solenoidal guiding field for the decay electrons. Additionally, my presence on the UW campus allowed me to contribute to the installation of a ROACH2 board and the adaption of the corresponding slow control applications for the data acquisition system of the Project8 experiment. Personally I benefited substantially from the iProgress internship program in many ways. Characterizing the detectors and working on the hardware and software side of the data acquisition systems for both TRIMS and Project8 enable me to contribute to the trigger development for Project8 as part of my PhD thesis. Assisting the assembly of the TRIMS main apparatus broadened my hardware knowledge and skills considerably and I enjoyed addressing all upcoming and unforeseen problems and solving them with the combined efforts of the excellent team at CENPA. Furthermore I feel that this has really strengthened my relationship with the other members of the KATRIN and Project8 collaborations at the University of Washington and I am looking forward to our continued cooperation. Thanks to the HAP i-PROGRESS internship, I was able to visit the Karlsruhe Institute of Technology (KIT) to study ultra-high energy cosmic rays. As part of my involvement in the Pierre Auger Observatory, I work with my KIT collaborators who have been developing a new method to analyze our cosmic ray events. When an ultra-high energy cosmic ray interacts with the air molecules high in the atmosphere it creates a large particle cascade called an air shower. At the energies Pierre Auger observes, the number of particles in showers is so large that fluctuations in the development of individual air showers are small. This concept is called universality. For a few years now, some of the Auger members at KIT, lead by Markus Roth, have been studying ways to incorporate universality into our reconstruction algorithm in order to increase the variety of measurements the Auger surface detectors can make. The i-PROGRESS internship allowed me to travel to KIT and work with this group to further my thesis work. Further, I was able to use the extensive library of air showers that researchers at KIT have not only simulated, but developed the software to do so. One of the most useful aspects of this trip was building a connection with my collaborators and being able to have face-to-face conversations with them about their work and mine. So far the work on using universality in Auger has been to extend the measurements of primary masses we observe to higher energies. My thesis work involves extending universality to lower energies instead. While on my trip to KIT I was able to discuss with my collaborators there strategies for developing the reconstruction method further. What I think I gained most from my i-PROGRESS internship is the personal connections with my collaborators that I would other might not have meet. Since arriving back at my home university in the United States, I have continued to work with the KIT researchers daily. I am really thankful for being given this internship and for having been given the opportunity to travel to KIT and work directly with my collaboration members. 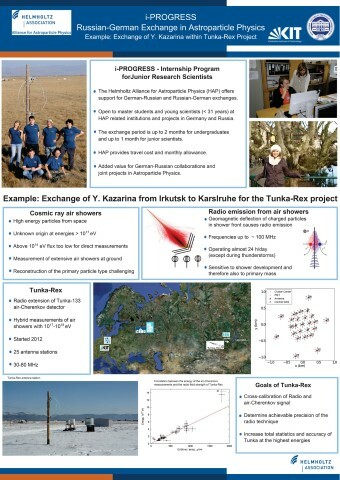 Main goals of my work at KIT have been the design of a ROOT container for Tunka-Rex data and the reconstruction of the air-shower core with radio measurements. I created an unified data container for storing Tunka data from scintillator and air-Cherenkov stations. The size of raw data stored in this Tunka-Rex data container (TRDC) is reduced by a factor of 7.6 to 16.4. The TRDC reader was also implemented in the Tunka-Rex branch of Auger Offline. EDELWEISS is a cryogenic experiment, using high purity germanium crystals as dark matter detectors. At the moment the collaboration aims to increase the sensitivity for the detection of light dark matter. Therefore a prototype detector was developed at CSNSM that uses voltage-assisted read-out of heat signals. In order that the detector sustains high electric fields (up to 100 V/cm) a new production process was developed. In first test measurements the prototype detector showed promising results and I went to Orsay to study the detector in an extensive calibration experiment. This experiment is of great interest for the light dark matter search as well as for my doctoral thesis. A good understanding of charge migration properties in the germanium crystals is mandatory for a proper detector performance and I am studying these properties by comparing the results from experiment with hot carrier transport simulations with special interest on charge trapping and scattering. I already performed a pulseshape analysis of charge signals for low electric fields (around 1 V/cm) (standard dark matter search mode for EDELWEISS), that showed a good agreement between experiment and simulation. As the charge migration properties are electric field depend, they are expected to change with increasing field. As I am analyzing both, experimental and simulated data, it was extremely helpful for me to work at the experiment in order to get a better understanding of the experimental set-up. I think the "iPROGRESS - Internship Program for Young Research Scientists" was a good opportunity to strengthen the international relationship in EDELWEISS. As CSNSM is also a large low temperature facility that is involved in many other cryogenic experiments, like for example LUMINEU (0ν2β project), my stay there allowed me to get an overview of actual cryogenic techniques and applications. In addition, I got in personal contact with other researchers, so that I could enlarge my lab and analysis expertise. One of the most fundamental questions in cosmology and astroparticle physics is the intrinsic nature of the matter content in the universe. Only a small amount of the density, namely 4.6%, is made of visible matter like stars, galaxies, dust and gas. The nature of the remaining remains a mystery. This fundamental open question on the nature of Dark Matter in our universe forms the central motivation for this research proposal. Sterile neutrinos in the keV mass range are prime candidates for Dark Matter. A unique way to search for them in a laboratory experiment is via tritium beta-decay. The existence of a sterile neutrino would add a spectral distortion to the beta-decay spectrum. Recent studies have shown that the Karlsruhe Tritium Neutrino (KATRIN) experiment (Germany) and the Troitsk nu-mass experiment (Russia) can reach an unprecedented sensitivity to detect sterile neutrinos. The direct search for sterile and the mass measurement of neutrinos at the Troitsk nu-mass experiment and KATRIN requires a deep understanding of all possible physical effects that could distort the shape of the tritium beta-electron spectrum. In my work crucial systematic effects, related to the detector section at KATRIN, namely detector backscattering and detector deadlayer were analyzed. Substantial simulation and analytical effort is necessary for a precise modelling these effects, which is inevitable for the successful realization of the experiment. During my being there I made simulations of electrons hited the detector using programs CASINO and KESS and comparing results. We studied energy of backscattered electrons and energy that electrons left in dead and sensitive layers. I made different energy distributions and at the end studied beta-spectrum considering effects of backscattering of electrons from the detector. Due to the HAP i-PROGRESS internship, I had such a nice opportunity to take part in the KATRIN experiment and to work in the group of scientists of Karlsruhe Institute of Technology (KIT) who gave me a lot of valuable advice! Thanks a lot for that! VERITAS is a ground based gamma-ray observatory consisting of an array of four telescopes, located in Arizona (USA) at an elevation of 1,268 m. These telescopes use the imaging atmospheric Cherenkov technique (IACT) for the observation of particle showers produced in the atmosphere by very high energy gamma-rays. A key piece of information, required to understand the astrophysical processes at play, is the energy of the primary gamma-ray photon. Estimation of this energy depends upon many individual factors, such as the atmosphere, mirror reflectivity, photomultiplier quantum efficiency, night sky background etc.. All of these various factors are known with limited precision and they change from one night to another night. This leads to a systematic uncertainty in the flux measurements of a gamma-ray source. During my stay at DESY, I have tried to evaluate these systematic uncertainties on the flux measurements using Monte Carlo simulations. The effect of atmosphere is evaluated separately, and all other factors affecting the flux measurements are combined into one factor by changing the quantum efficiency ± 20%. Only those observation conditions (zenith angles, atmosphere and night sky background) are sampled which are relevant for the source which will be studied in my PhD thesis( the supernova remnant Cassiopeia A).Based on the Monte Carlo simulations created, the effect of the atmosphere on the systematic errors is only few percent (~5%), the effect of all other factors combined together is about 20-25%. For this internship my research focused on my analysis using the IceCube neutrino observatory. This analysis relates to a measurement of the atmospheric-neutrino flux-integrated differential cross-section. I worked with the IceCube group at the Johannes Gutenberg University Mainz (JGU) firstly to assess the progress that had been made so far in this endeavour and to come up with a plan for future progress. I was able to meet with IceCube members at JGU who were pursing a very similar measurement to mine and so we were able to coordinate face-to-face and organise which aspects of the analysis we would handle. We decided that a toy Monte-Carlo (MC) was necessary to answer outstanding questions about the direction of our analysis, so during the month I was there I was able to create and flesh out this toy MC. This consisted of a variety of stages which were responsible for a particular step in the generation of our template. I started with a stage to read in the atmospheric neutrino flux values from a pre-generated MC flux table [see Phys. Rev. D92, 023004 (2015)]. Then I created some cross-section splines using the GENIE neutrino MC generator [see Nucl. Instrum. Meth. A614 (2010) 87-104] which I then loaded into the toy MC and then multiplied by the flux, exposure and detector geometry to obtain a measure of the optimal number of neutrino events per bin one would expect to see. Then I parameterised the efficiency of each bin to match work that I had previously done on a IceCube event selection, which then gets applied to the template as the next stage. The final stage uses a gaussian curve to "smear" the result to take into account migrations between bins in the presence of statistical fluctuations which occur in the measured data. This pipeline allows us to mimic the measured data, which is the first step when doing any sort of analysis. With this toy MC in place, I along with the IceCube group at JGU can move forward by using it to try to answer questions such as "which unfolding algorithm should we use? ", "should we include background subtraction in the unfolding?" etc. The KATRIN experiment is a model-independent approach to determine the mass of the electron anti-neutrino with an unsurpassed sensitivity 200 meV. It is located in Karlsruhe, Germany and first measurements are planned for the near future. One of the collaborating institutes is the University of Washington in Seattle, which is responsible for the design, commissioning and operation of the detector system of KATRIN. In order to reach the very high sensitivity goals, the impact of cosmic muons in the detector section must be reduced to a minimum. For this reason, a muon veto system was planned, which surrounds the detector wafer and detects muons that pass through the sensitive area. Thus, the events, linked to a cosmic muon, can be excluded from the experimental data. Within the scope of my Master Thesis I investigated several background sources in the KATRIN main spectrometer and was a part of the detector team. This combination gave me the opportunity to participate in the assembly and test procedure of the muon veto system at the Center of Experimental Nuclear Physics and Astrophysics (CENPA) at the University of Washington. By now the system is installed in the KATRIN experiment and it works impeccably. The "iPROGRESS - Internship Program for Young Research Scientists" gave me the opportunity to visit the wonderful city of Seattle and to work together with the great scientists at the University of Washington, which was a valuable experience in my scientific career. The KArlsruhe TRItium Neutrino (KATRIN) experiment aims to determine the effective mass of the electron anti-neutrino through precise measurement of the kinematics of tritium beta-decay. The KATRIN collaboration consists of several institutes and universities from five different coun- tries. One of the collaborating institutes of the KATRIN Experiment is the University of Wash- ington in Seattle. It is responsible for design, commissioning and operation of the detector system. During my Master Thesis I was part of the detector team and reassembled the detector for the next measurement phase which started recently. The detector consists of several sub-systems and components with the post-acceleration electrode (PAE) being an important part of the system. This electrode, designed to operate up to 30 kV, experiences issues with electrical breakdown when exceeding a third of its design value. In order to further investigate this phenomena a separate test stand was built with the collaboration partners of the University of Washington in Seattle at the Center of Experimental Nuclear Physics and Astrophysics (CENPA). This apparatus allows to visually observe the breakdowns within the PAE. Initial tests were successful but additional tests are necessary to fully understand the phenomena within the PAE. The "iPROGRESS - Internship Program for Young Research Scientists" gave me the opportunity to gain scientific experience working abroad with with great and experienced scientists and staying in the wonderful city of Seattle. I developed a growing interest in astroparticle physics and during my stay in Erlangen, Germany in September – October 2015, I contributed to the integration and verification of KM3NeT multi-PMT modules. This module represents a new optical sensor design for photon detection in harsh environments like the deep sea. Instead of a single large PMT, this design incorporates a large number of small (3 inch) PMTs, thereby enhancing the effective detection area per module and providing additional information on the detected photons like directionality. I worked on the preparation of the PMT for their integration into the optical sensors and the characteristics of a new PMT model from ET Enterprises 9320. Type 9320 by ET Enterprises is a 3.5" (90/78 mm) diameter, thin domed entrance window photomultiplier with Bialkali photocathode QE ≈ 20% @ 470 nm. It has 10 high gain, high stability, SbCs dynodes of linear focused design for high gain and stability, fast timing, good pulsed linearity, low afterpulses. Me studies have been conducted an experimental batch of PMT: quantum efficiency, single photoelectron response, afterpulses, dark count rate.Also, I have been proposed ways of the possible evolution of test facility and software. Results of my research were presented in reports of the Collaboration. My stay in Erlangen will be important for ideas to develop a new optical module for the second phase of Baikal-GVD and significantly expanded my understanding of the principles of the PMT and methods of working with them. The main goal of my study in the framework of iProgress grant was a preliminary analysis of the short aperiodic loaded loop antennas (SALLAs) recently installed at the site of the Piere Auger Observatory in Argentina. This type of antenna is used also in the Tunka Radio extension (Tunka-Rex) in Siberia. There it is performing well with its very high durability and simplicity of structure.